Known as one of the best summer clubs in Europe, Cavo Paradiso has been bringing some of the biggest names in electronic dance music to Mykonos for more than 20 years. Known as one of the best summer clubs in Europe, Cavo Paradiso has been bringing some of the biggest names in electronic dance music to Mykonos for more than 20 years. The club was the brainchild of owner Nikos Daktylides, whose vision was to create a venue away from the busy party town of Mykonos, taking advantage of the island’s natural beauty. 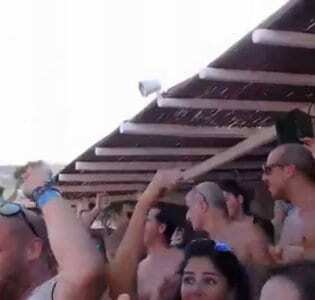 Despite some scepticism from others in the Mykonos nightlife industry, he built his club on an otherwise deserted hilltop, overlooking the Aegean Sea. It boasts bars on two different levels, a large terrace to make the most of the spectacular views, and a pool in the shape of Mykonos. And since it opened in 1994 thousands of clubbers have been flocking here every year. They’re drawn in part by the unique setting, but mainly by Cavo Paradiso’s global reputation as one of the best dance venues around, and the superstar DJs it attracts, including Paul Oakenfold and David Morales ‐ who celebrated his 40th birthday here. An intense summer schedule of back to back events featuring some of the biggest names on the circuit runs from the beginning of July until the end of August. Unsurprisingly, the place gets packed on big nights, but a table reservation will get you priority entry into the club.